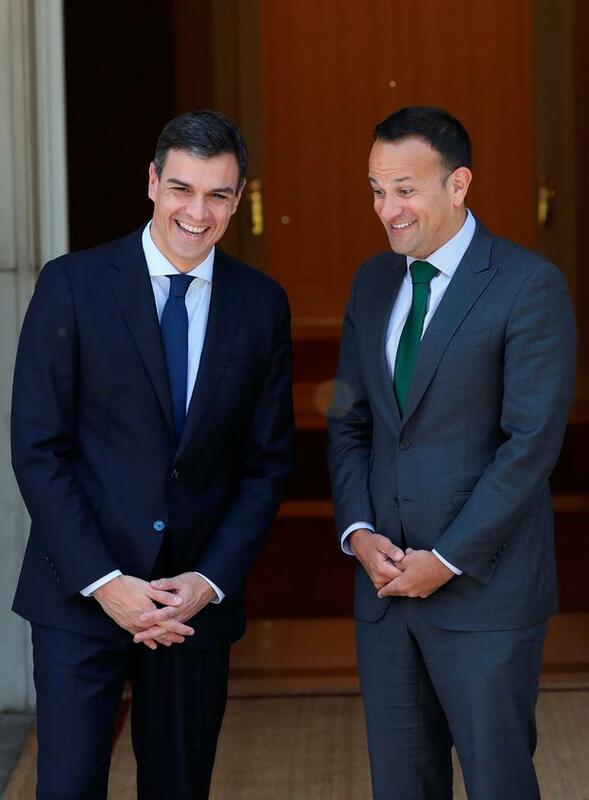 For a leader facing surgical dissection of his performance in his first year as Taoiseach, and the growing prospect of an election battle for a second term, Leo Varadkar showed little sign of it during his fleeting visit to Madrid. At home, the Opposition was ramping up the attacks – but in Spain he enjoyed what he described as “one of the best and one of the warmest meetings” he has had with a fellow prime minister to date. He was light on his feet when he arrived, late, to the meeting at the Moncloa Palace with newly appointed Pedro Sanchez. The pair greeted each other like old friends rather than new acquaintances. During a stroll through the palatial gardens they appeared to chat easily, before getting down to brass tacks at a working lunch. Despite some well-publicised gaffes, the Taoiseach is often at his most comfortable abroad, meeting his counterparts throughout Europe. But with Mr Sanchez there was more than ample common ground to cover beyond business – not least the Spanish premier’s time spent in Ireland learning English, when he managed to catch Shamrock Rovers play Manchester United in the capital. The new PM is also leading a minority government, but pundits suggest that owing to the unusual rise of Mr Sanchez – his no-confidence motion was the first in Spanish history to unseat a sitting PM – he will face an election sooner rather than later. The Taoiseach also gave his clearest indication to date that he too recognises the threat of a looming election, hastened by a no-confidence motion he expects Sinn Féin to table. But he made a deliberate point of throwing down the gauntlet at the feet of Mary Lou MacDonald. The Taoiseach also took in one of Spain’s most famous pieces of artwork in the Reina Sofia Museum where he was treated to a guided visit to Picasso’s Guernica. Even in Madrid the Taoiseach was greeted warmly by tourists, including a family from LA and one from Derry, who were pleased that their holiday had included a chance meeting with the Fine Gael leader. At a garden party in the Irish ambassador’s residence Mr Varadkar met with business leaders from the Irish community in Spain and looked relaxed against a background of mellow music and animated chatter. He posed for endless pictures, including with embassy staff who quipped that he was our “giant” Taoiseach. In the Dáil this week he said he wasn’t one for celebrating anniversaries – but if he was inclined to mark it the trip was probably among the best options. Away from the spotlight, and in the sunshine, he could leave his domestic worries at home for a time at least. Previous articleHow did everybody cope with the World Cup’s mammoth four-game Saturday?